"The York Street tragedy stands as a symbol of the city's long practice of neglect," the grand jury report says. "We saw how the city's longstanding reluctance to take action against tax-delinquent owners of large, decaying buildings fosters a damaging culture of nonpayment and noncompliance." "Owners have come to realize that there will be no repercussions, and that they will not be held responsible, if they ignore 'final warnings' from L&I, and tax and water bills from the revenue department." L&I, according to the city charter, is responsible for protecting public safety, inspecting large vacant commercial structures, issuing violations and enforcing compliance, the grand jury report says. "With respect to the York street property, L&I failed in its mission," the grand jury report concludes. "It did not adequately inspect, it did not enforce, and it did not protect public safety." The grand jurors tried to find out whether the 2012 fatal fire had led to any "substantial improvements in [L&I's] procedures as a result of the breakdowns that occurred in this matter." "The answer is a very clear 'no,'" the report says. Sadly, the grand jury concluded there was "no criminal penalty for the tale of misdeeds we found. While the building owners violated virtually every regulation that got in their way, they were never held accountable for doing so ... had city departments done their job, these deaths might never have occurred." The Lichtensteins were "unscrupulous from the start," the grand jury report says. They agreed to pay $750,000 when they bought the building in 2008. But they delivered only half that amount, and promised to pay the rest within 45 days. But that 45 days turned into years. The seller, "worn out by the Lichtensteins' delay tactics ... settled for a fraction on the dollar," the report says. 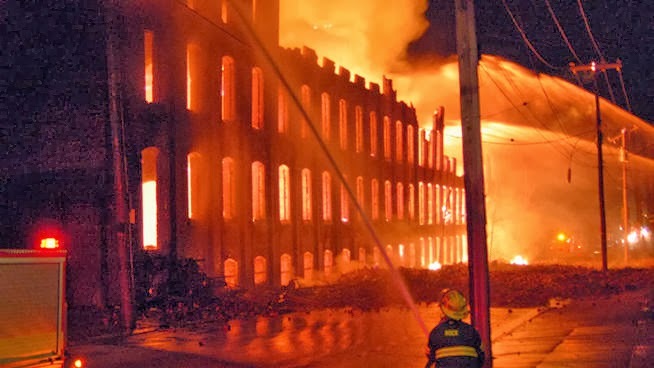 City laws required the owners to maintain a working sprinkler system in the building, and/or clean and seal the premises so that no one could enter. But, the report said, "there is no evidence that the Lichtensteins did anything to bring the building up to code." Meanwhile, the grand jury found, the abandoned factory was invaded by prostitutes, crackheads and scavengers. The floor was covered with puddles of water; the building had more than 80 visible broken windows. Neighbors filed 30 complaints, but L&I ignored most of them And when they weren't ignoring those complaints, L&I inspectors made cursory inspections, and then wrote in their files that the matter was "resolved." since they bought the York St. property in 2008," the report says. "In fact, the Lichtensteins are still the legal owners of 1817-41 York St., which is now only a vacant lot, and owe the city over $100,000 for the demolition of the burned-out shell." Between 2009 and 2012, four different L&I inspectors visited the property and issued violation notices. But those notices turned out to be "merely superficial steps that did no more than keep the bureaucratic wheels spinning," the grand jury report says. L&I did not keep track of cumulative violations. Each time it sent an inspector out, L&I issued a new case number "thus treating the property as if it had no previous violation history," the grand jury report says. The first building inspector to visit the property in 2009 issued fire and property code violations. A second inspector showed up in 2011. He opened a new case number which "effectively disregarded all previous uncorrected violations," the report said. When he was called to the grand jury, the second building inspector testified that he "didn't concern himself with the prior case because it was not "my complaint." The second building inspector never went inside the property. He "just looked around the outside," the report says, and issued a clean and seal violation notice. A third and a fourth inspector visited the property in 2012. The fourth and last inspection took place a week before the fire. "Obviously, the department lacked, and apparently still lacks, even the most basic controls to ensure that inspections are properly performed, that information is appropriately consolidated, and that violations are promptly prosecuted," the grand jury report says. "They [L&I inspectors] created paper, but no results." In their report, the grand jurors express frustration over L&I's history of incompetence under former Commissioner Fran Burns and current Commissioner Carlton Williams. "The Buck factory was a large property, the focus of neighborhood complaints for years, with problems presenting a genuine danger," the grand jury report says. "If that wasn't enough to motivate any real action, how can we conclude that anything else would have been?" "The secret was spilled by both the current and past L&I commissioners," the report says. Both Burns and Williams "admitted that the Department does not really want to take large properties with serious violations before a judge. It turns out that if the building owner is unavailable to unable to pay for repairs, the court has the power to order the city to bear the cost." The city could have exerted leverage on the slumlords by holding up requested permits and a request for a much-needed zoning change, from commercial to residential, the grand jury report says. But L&I "simply granted the requests, both initially and for renewals," the report says. "It was as if the multiple fire and building code violations didn't exist." This is what business friendly government looks like. At the time of the fire, the owners owed the city almost $400,000 in back taxes. "Apparently, however, no one even checked" before the zoning change granted, the report says. The city's Department of Revenue is responsible for collecting back taxes. But the department kept sending court actions to the wrong address. Those court actions were repeatedly dismissed because notices were sent to the vacant factory on York Street, rather than the company's office, the grand jury report says. Four times, the Water Revenue Bureau made the same mistake, sending legal actions to the wrong address. Four times, those actions were dismissed. "In fact, the Lichtensteins still owe thousands, and the Water Revenue Bureau is still sending the bills to an empty lot," the report says. During the fire, a brick wall that was part of adjacent furniture store collapsed. 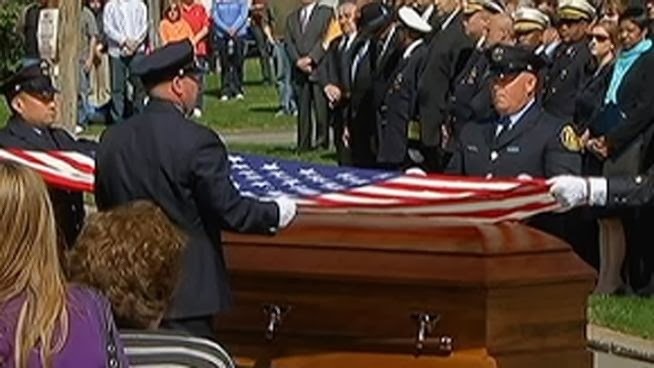 Four firefighters were buried under tons of bricks. Firefighters Patrick Nally and Francis Cheney, were seriously injured in the collapse. Lt. Neary and Firefigher Sweeney died before rescuers could dig them out. "With great frustration, we have concluded that criminal charges are not available, at least on the present state of the evidence and the law," the grand jury report says. "From what we know, the bureaucrats at L&I were guilty of indifference, not crime. The Lichtensteins were a closer call." The grand jury report blasts L&I officials for not holding the Lichensteins accountable, but also for providing them an alibi with false testimony. "It's not just that L&I failed completely to bring the owners to court and enforce the code; it's worse than that," the grand jury report says. "After generating notices that went nowhere, L&I inspectors testified that the property was properly sealed from intrusion with intact fencing and entrances. This contradicts all other evidence, and shows us that at least some inspections were spurious. Nevertheless, they [L&I] hand the Lichtensteins their best available defense." "We saw systemic failures at every level of L&I," the grand jury concludes "We believe it is time for a through review of the entire department by a truly independent agency." 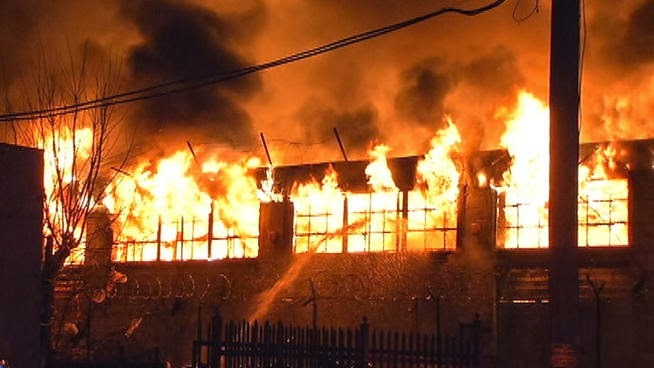 The grand jury called for the creation of a task force that would include L&I, the law department and the fire department, to address code violations in large vacant structures. The grand jury also called for the amendment of the criminal code to allow criminal prosecution of property owners who refuse to correct dangerous conditions. The grand jury report says that L&I, the city's law department, and revenue department watched helplessly as the property on York Street deteriorated. "The Lichtensteins demonstrated no serious intent to develop the York Street property," the grand jury report says. "They [the Lichtensteins] put no money into protecting it structurally. They allowed scrappers to steal valuable copper piping and dismantle the wiring and the elevator. They made little or no effort to keep squatters from entering the building. They obtained a demolition permit, but let it languish. They had no building plans, no building permits, no construction or demolition contracts, no construction financing, and no prospective tenants. And they failed to pay the city of Philadelphia a dime in taxes or water and sewer rents." In spite of overwhelming evidence that the Lichtensteins were slumlords who didn't care about public safety, the officials over at business friendly L&I, as well as the rest of the Nutter administration, did nothing to protect lives. The grand jury report assigned blame to each city agency involved in the mess. "L&I repeatedly issued code violations against the York Street property, yet did not follow up, and did not require the Lichtensteins to obtain a vacant property license or sprinkler variance," the grand jury report says. "Simultaneously, the Revenue and Law Department did little to collect unpaid real estate taxes and water rents amassed against York Street," the grand jury report says. "Despite the code vocations and tax delinquencies, L&I still issued zoning and demolition permits to the Lichtensteins. None of these departments ever investigated and connected the dots to sermon what was glaringly obvious -- that the Litchentenstens had no intention of complying with the law." The report ripped Fran Burns, Nutter's L&I commissioner from August 2008 to May 2012. "Despite the potential for large-scale catastrophes from neglected large vacant commercial properties, L&I saw no need to prioritize or take proactive measures with regards to these properties," the grand jury report says. "To the contrary, the Department has long avoided taking owners of these properties to court. Commissioner Burns explained that the concern is that, where the owner cannot be located or will not comply, the court could instead order the City to take the remedial action itself and foot the bill." That upset the grand jury. "But avoiding court is penny wise and pound foolish; a conflagration that endangers and kills is far most costly than cleaning and sealing," the grand jury report says. "Further, in this case, the owners could be found and there is no reason to believe that a court would have ordered the City, rather than the Lichtensteins, to remedy the violations." "Burns further explained that, under her watch, vacant commercial properties would only be inspected ever few years 'because usually they are maintained,'" the grand jury report says. "No specialized unit deals with vacant commercial and industrial properties. No special coding system identifies or categorizes these properties in L&I's database because 'it would take some mechanics and some work to do on the technology...' Thus the Department has no way to identify or prioritize these properties, and no apparent interest in doing so." "They should have," the grand jury concluded. "The steady deterioration of large vacant properties like York Street is inevitable, where, as here, owners refuse to remedy code violations. The sheer size of these properties and their proximity to residential and commercial properties means that their decline endangers a significant number of citizens and businesses. And in this case, it obviously was not true, as Burns maintained, that such structures are 'usually ... maintained.'" The grand jury report says that Commissioner Burns tried to portray L&I's actions in this case as an "example of a new, improved process she had implemented at L&I" in 2010. Burns new policy: if a property had three failed inspections, L&I was supposedly going to take the property owner to court. The facts, however, showed that the "Lichensteins received seven separate violation notices, and still, L&I never actually took them to court," the grand jury report says. "It just issued empty threats." The situation did not improve since Carlton Williams took over as L&I Commissioner on June 4, 2012. Under Williams, L&I has an annual budget of $21 million, and 320 employees, including 200 inspectors. "Unfortunately, certain ineffective practices and procedures have remained as well," the grand jury report says. 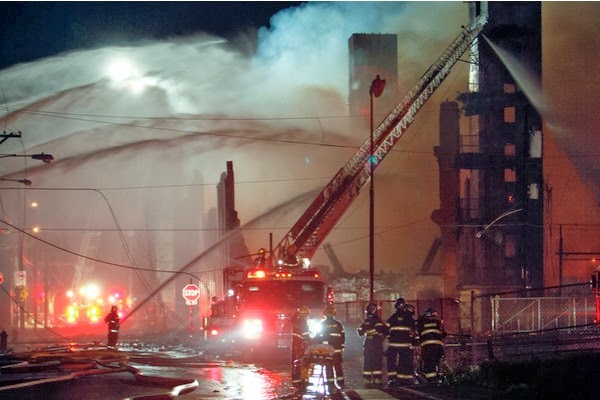 "L&I did not, and despite the York street fire, does not, prioritize large vacant structures." "Commissioner Williams told us that 'there is a bit of reluctance' in L&I to deny permits to tax delinquents," the grand jury report says. "The way he explained it was, 'If you don't grant that permit to repair, you are leaving an unsafe condition,'" the report says. "But he situation here was not whether or not to issue a permit to correct an unsafe condition. The Lichensteins had no interest in repairing unsafe conditions, and no permit was necessary to correct the multiple vocations at their property. Further, tax delinquency correlates to blight; it is a red flag that L&I should heed. We simply do not understand, or find acceptable, L&I's 'reluctance.'" "Well the problem is, it becomes a resource issue," Williams told the grand jury. "If we declare something imminently dangerous, actions -- the court expects you to take action. And if it it something that is structurally stable, but still a problem or nuisance to the community and if you put them in that court, if the property owner doesn't take action, then the City has the burden of that responsibility." "In other words, it remains L&I's practice to avoid taking owners of large vacant properties to court," the grand jury report says. "This institutional reluctance to take owners of large, vacant commercial properties like York Street to court is at odds with L&I's mission of protecting public safety." Our globetrotting mayor is out of the country again, visiting South Africa this week. His chief of staff, Everett Gillison, told The Philadelphia Inquirer that administration officials were reviewing the grand jury report, and would comment "in the days to come." In the mayor's absence, the Inquirer's Troy Graham devoted just nine paragraphs to the grand jury's devastating 110-page critique of L&I and the last two unqualified L&I commissioners appointed by Nutter. The Daily News, in a Thursday editorial headlined "A Slow Burn," said that "Every elected official from the mayor on down should be embarrassed by the dysfunction shown here." But you won't read that kind of stuff in the Inquirer, where the City Hall bureau continues to cover for our absentee mayor. 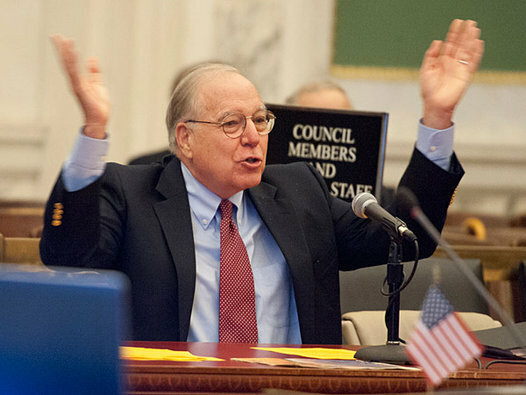 To former L&I Commissioner Bennett Levin, the grand jury report ratified his testimony at last year's City Council hearings on the fatal building collapse on Market Street. Levin criticized Nutter and Burns for politicizing the department, and for prioritizing economic development over public safety. In response, Nutter called Levin out of touch. "The grand jury by their findings has shown that it's not me that's out of touch, it's Nutter who's out of touch," Levin said. "The grand jury report is the worst indictment of the Nutter administration because you have two dead firemen for no apparent reason. Except that for the last 15 years, there's been no political will to let the department function free of political interference." Another more recent example of L&I's indifference and neglect of public safety is in Northeast Philadelphia, at the 11.7 acre site of a former giant furniture store. Neighbors have repeatedly complained that the site has been operating as an illegal landfill, and has become a dangerous magnet for local kids. The incompetence of business-friendly L&I continues to have deadly consequences. On Aug. 19, 2013, police found the body of a 19-year-old man who was executed there, shot up to a dozen times. Dear M. Marple, I am astonished at the way this story has been underplayed in both papers. At least the Daily News ran their editorial. The Inky seems to be dedicated to protecting our mayor. Nutter is the guy who appointed two sorely lacking L&I Commissioners. Bennett Levin was a civil engineer and had the moxie to stand up the politicians, which ultimately cost him his job. When Levin was there [I covered him for the Inky] eyesores like the factory on York Street and that former furniture factory in NE Philly were torn down. With Nutter in office, his L&I Commissioner are more worried about economic development, rather than public safety. The developers get a pass at business-friendly L&I. And people die because of it, firefighters and citizens. Only in a town where the Democratic party has a chokehold on the two daily newspapers is this not a story. It should be a crusade.